The Fort includes a number of attractive tourists’ destinations such as the Raj Mahal, the Laxminath temple and several exquisite and grand palaces. There are a number of popular and beautiful Jain temples inside the premises of the Fort. The merchant mansions or the Havellis in Jaisalmer Fort are renowned for its exemplary architectural beauty, decoration and designs. Some of these Havellis are occupied by the predecessors of the Royal families whereas some of the Havellis are transformed to luxurious hotels for tourists. The Jawahar Palace is another attraction of the Jaisalmer Fort and it is occupied by members of the royal family. The splendid designs and embellishments used on the walls and ceilings of the palace are commendable. Several Jain temples can also be found inside the Fort which is dedicated to Jain Tirthankaras. One of the most attractive tourists’ spots in Jaisalmer Fort includes the five exquisite and elegant palaces which include the Akhai Vilas, the Rang Mahal, Sarvottam Vilas, Gaj Mahal and the Moti Mahal. The Rang Mahal is the most attractive and exquisite palace among the five palaces in the Fort. The palace is popular for its consummate architectural designs and patterns, mural paintings, artistic interior designs and colorful glass paintings. Intricate carvings and designs adorn the ceilings and walls of the palace. 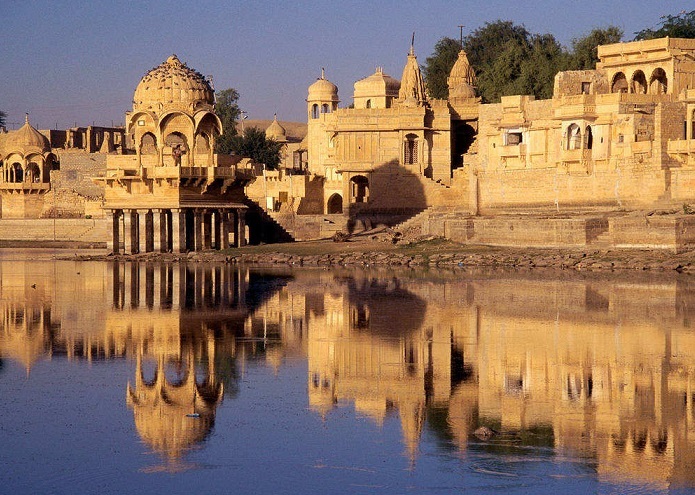 The Jaisalmer Fort is rightly known as the Jewel of Rajasthan as it is situated in the midst of the Thar Desert.